Financial Regulation Matters: Renewed Calls for the Break-up of the “Big Four” Audit Firms: Another Example of “Divergence”? 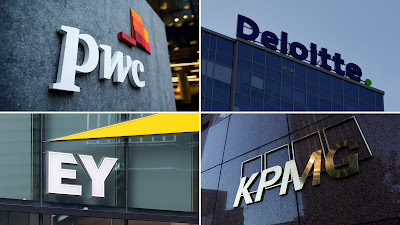 Renewed Calls for the Break-up of the “Big Four” Audit Firms: Another Example of “Divergence”? In today’s post, the focus will be on the so-called “Big Four” audit firms – PwC, KPMG, Deloitte, and E&Y – after details of the collapse of construction firm Carillion continue to have a significant effect. We will examine these calls to dismantle the long-standing oligopoly, but there will be a discussion about what these calls actually mean. This author has advanced the notion of a ‘divergence’ existing when it comes to regulating oligopolies (specifically in relation to the Credit Rating industry), and it will be discussed whether this is the case in this particular instance also. There will also be some reference to a forthcoming book by this author on this very topic. The calls for the dismantling of the audit oligopoly could stem from a number of instances in reality, but the current calls stem from the collapse of Carillion. We have covered this collapse here in Financial Regulation Matters since the first warning-signs were uttered, but the revelations regarding the passive action of the associated auditors before the company’s collapse have renewed calls for a new approach to how auditing services are provided. With auditors being accused of ‘lining their pockets’ in relation to Carillion, the Labour Party has been extremely vocal in calling for the oligopoly to be dismantled. John McDonnell recently declared that if his party was to come to power, then the firms would no longer be able to ‘act like a cartel’. He also declared that ‘there will be no more Carillion on Labour’s watch’. Essentially, McDonnell is taking aim at the regulatory framework, which was confirmed when he continued his attack by discussing the number of regulators in the field, and also the fact that a number of key market participants are essentially self-regulated. These calls have been echoed, in a loose sense, by others including the chief regulator for the sector in Britain, the Financial Reporting Council. Whilst not seeking the dismantling of the oligopoly, the FRC have launched an investigation into whether the firms should be forced to ‘spin-off’ their auditing businesses, with the result being that there are rumours that the firms are actively preparing for the onslaught coming their way. However, are these claims, suggestions, and investigations all as they seem? Whilst McDonnell was adamant in his view that there will be no more collapses like Carillion on his (and his Party’s) watch, that is a tremendously easy thing to proclaim when one has no power. Perhaps the reality is slightly different if we consider that the collapse of Carillion was, fundamentally, because of deep-rooted systemic issues rather than simple policy ones as McDonnell’s sentiment suggests. This leads us nicely to this concept of a ‘divergence’ being in operation. In the author’s forthcoming book Regulating the Credit Rating Industry: Restraining Ancillary Services (to be released in August), this concept of a ‘divergence’ is presented in detail, but for our purposes a simple explanation will suffice. In relation to the credit rating industry, the ‘divergence’ exists when regulators and legislators take aim at the industry and introduce measures such as increasing competition; the ‘divergence’ relates to a ignorance of a simple reality that is the very nature of an oligopoly is that competition is fundamentally reduced. Another simple reality of an oligopoly is that, whether directly or indirectly, the oligopoly by its design works together to protect itself; this can be done in a number of ways but an obvious and representative method is a member of the oligopoly never deviating from accepted methodologies in relation to their practice, so as to not cause a significant disturbance to the marketplace – this is a key component of the ratings industry, and the same can be seen in the audit industry if one looks closely enough. Yet, the biggest issue with the current wave of criticism is that it pays not attention, whatsoever, to the history of the sector. The rating industry is over 160 years old but that pales in comparison to the audit industry. As a result, the firms are actually gargantuan businesses with their operations being truly global in size, which has the effect of making them a. extraordinarily wealthy and b. extraordinarily influential. The obvious claim to make is that this will allow the firms to protect themselves rather adequately in the facing of the oncoming regulatory pressure, but history tells us that McDonnell’s vision will, unfortunately, never come to fruition. If one examines developments within a given financial sector (particularly with financial service providers), and studies those developments in parallel with a study of the economic cycles, one will quickly realise that we have been here before. In the wake of the Enron scandal, the auditing industry came in for massive amounts of pressure, and as a result were forced to divest from their consulting businesses which lay at the root of the scandal. Whilst the rating industry would both learn and profit from the divestment (the model was fundamentally incorporated by the agencies [as described in the forthcoming book] and many of the consulting components were swallowed up by the CRAs), the audit sector would go on to simply bide their time until the economic cycle swung back to a boom – only a handful of years passed before the firms were allowed to build up these divisions again under a different moniker. It surprises this author greatly that the audit firms did not come in for more criticism in the wake of the financial crisis, because they were indeed involved, but perhaps they had learned not to be so brazen in their practice – the rating agencies are presumably going through that very same process as we speak. Yet, it is difficult to be optimistic when one studies history, because it is more than likely that once ‘regulatory amnesia’ sets in, as it will, then the chances of the audit industry having its influence lessened becomes an illusion that is, in reality, probably damaging on the long-run. The effect of this understanding is that it leads to political questions that have no real answer (perhaps). Examining McDonnell’s claims, is it the case that he fully intends to ensure that Carillion-type scandals can never happen again and that he will dismantle the audit oligopoly, or is it the case that these issues are making the headlines and his claims are the obvious ones to make when playing the position of the opposition? The aim here is not to criticise McDonnell nor doubt his integrity, but it is important to remember that this is politics and with that come a whole host of connotations. The sentiment put forward here is that if one aims at an industry as it should be without considering how that industry performs in reality, then that divergence leads to misapplied regulation, which has the effect of maintaining the dominance of that particular industry. The author’s specialism is in the field of credit ratings, and it can be seen quite clearly in that sector that the divergence that surrounded post-crisis endeavours has actually strengthened the rating oligopoly, not weakened it. It is likely that this current wave of anti-audit sentiment will do the same if such large-scale measures like dismantling the oligopoly are the aims. In a forthcoming book by this author entitled Regulating Financial Oligopolies (to be released in 2019), the focus is on this very divergence and how the regulators see the actual process of regulating an oligopoly, and more important how they consider it when taking regulatory action. The underlying thesis to many of this author’s works is that incremental regulation is optimal, rather than large-scale headline-grabbing regulation that is rarely effective; limiting the effect of these financial oligopolies and guiding them towards fulfilling their function rather than exploiting their engrained positional advantage is surely more of a practical aim that outright destruction of oligopolies that are centuries old. With that in mind, it appears the opposite sentiment will be incorporated in the near regulatory future of the audit industry, and unfortunately that sentiment only ever has one consequence – failure. Keywords – audit, politics, business, law, financial regulation, credit rating agencies, oligopolies, @finregmatters.